In 2014, Kathy Lavelle, former Director of Health Records, currently the CFO, came on board at Woodstock Hospital and quickly noticed there was a technology gap. “It was a challenge to access historical records, because they were still on paper. Clinical staff had to call Health Records, who then had to go search for the record. It was causing significant delays for clinicians who needed the information to provide the best care possible,” said Lavelle. 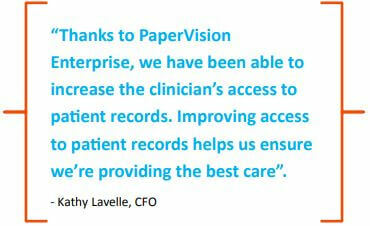 “We were already using PaperVision Enterprise, an on premise enterprise content management (ECM) service, for archive storage, so I was anticipating that we could leverage the existing technology in new ways.” After expanding how PaperVision Enterprise was being used in the hospital and adding PaperFlow to handle their in-house scanning needs, they have improved access to information, reduced document retrieval times, and saved money. the patents and the community. Managing files that were on paper was tough, and finding patent records was becoming increasingly time-consuming. “There was a lot of information still being stored on paper, so when a patent would come into the emergency room, we would have to take the time to physically find their old records,” said Lavelle. “It was very frustrating for clinical staff to have to wait for information they needed to provide care, especially in the emergency room when decisions need to be made quickly.” Security and auditing was another driver for change at Woodstock Hospital. Records that were on paper were easy to change for multiple people to view. “While the file was checked out, we couldn’t track whether it had been updated or changed and you had no way to know who had viewed what or when,” said Lavelle. Lavelle knew that if they could leverage the technology they already had, they could come up with a plan that would save the hospital money and provide a quick return on investment (ROI). The goal was to have a system that would improve the quality of patent care, improve document security and save the hospital money. 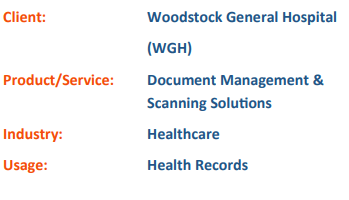 Woodstock Hospital worked with Polar Imaging, a document management and imaging company based in London, Ontario. The hospital wanted a system that would allow them to expand beyond simply storing old documents. The hospital now wanted to digitize their patent files and they chose to take advantage of the additional features of PaperVision Enterprise. Polar Imaging handled their scanning needs for more than 10 years, totaling more than 12 million pages. In 2015, the hospital installed PaperFlow to so they could start scanning in house. before we didn’t ever really know.” In addition, because all records have been converted to electronic format, the hospital is 100% protected from loss, theft or natural disaster. Woodstock Hospital has been able to significantly reduce their staffing in Health Records because of scanning. “We used to have 24/7 coverage just to handle the phone calls. Now we can run the department just during daytime hours, and have eliminated the need for after-hours coverage.” said Lavelle. This has saved the health records department approximately $244,000 a year. 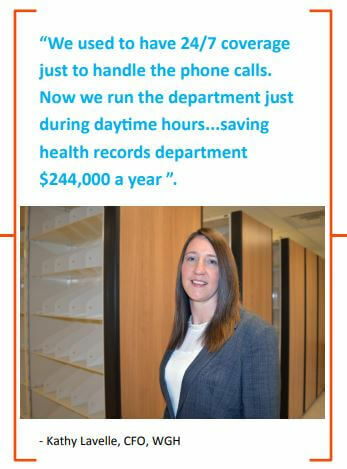 In addition, now that the health records department has eliminated most of the paper, they are able to save over $25,000 a year in office supply costs. Like most hospitals, improving the quality of patent care is the number one priority at Woodstock Hospital. “It is really important to us to be able to provide top notch patent care. Thanks to PaperVision Enterprise, when anyone needs to access a patent’s file they can do so immediately,” said Lavelle. “This has been especially important in our emergency room — where every second counts.